Hello all! I hope you are enjoying your weekend! I am finishing up on thank you cards this weekend. I have quite a few to make, but I didn't want to make the same design, so I just made a few of each. 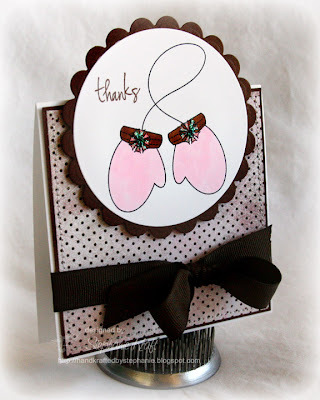 Here are a couple of variations on my pink/brown thank you cards. Once again, I used Verve's Winter Mittens digi. The thanks sentiment is from Celebration of Thanks. I kept these versions fairly simple and limited the layers and bulky embellishments so I can send them out with one stamp. The first version is a tent topper card, and the second one is 4.25" x 4.25". In both cases, I colored the mittens pink and brown and finished off th snowflakes with Star Dust stickles. I popped the images with foam tape and added a little stitching. Accessories: Square, Circle and Scalloped Circle Nestabilities (Spellbinders), Apron Lace border punch (Fiskars), Star Dust Stickles (Ranger), Ribbon, Foam tape, Thread, Sewing machine. These are so adorable!! Love that layout on the first one, very clever. Also love the pink & brown, my favorite colors together.